Stored XSS vulnerability on YouTube actively abused? XSS vulnerabilities are often underestimated, but they can sometimes be extremely dangerous. 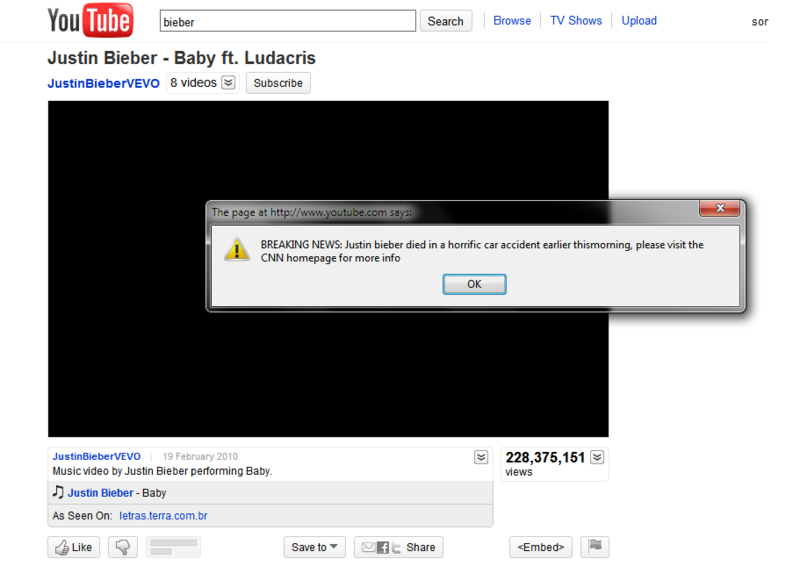 It looks as if couple of hours ago attackers started exploiting what looks like a stored XSS vulnerability on YouTube. I don't want to go into details on how to exploit it until YouTube fixes it, but it indeed looks pretty widespread already. So far, all exploits I've seen just enter some benign HTML and are more of comment spam, but as this appears to be a full-fledged vulnerability things could get out of control easily unless this is fixed. We'll keep you informed on the development of this. We received a lot of questions from our readers asking details about the vulnerability. Now that Google patched it, we can explain how it worked. The backend comment application used by YouTube incorrectly encoded output data – only the first entered tag was correctly encoded, so by supplying the comment with two <script><script> tags, the browser would get back the following: &ltscript&gt<script>. We can see here that the first tag is properly encoded and will be displayed by the browser as it is supposed to, but the second tag actually starts script code. This incident shows how important it is to properly check every single point of your application that receives data from users, or displays it back to them. Besides correctly encoding data that is sent back to the browser, the script could have been fixed by also properly encoding data immediately after receiving it from the user. Luckily for Google, the vulnerability has only been abused by various users to "hide" other comments – they weren't really hidden, they just weren't displayed because the rendered HTML code was broken due to supplied malicious code. Before ending this diary, below you can see a screenshot of one exploit of YouTube that didn't just "hide" comments but also displayed a popup to the visitor. There is a vulnerability posted in June under CVE-2010-2225 regarding a bug in the PHP SplObjectStorage. I found an excellent analysis made for this vulnerability, including a POC. More information at http://nibbles.tuxfamily.org/?p=1837#more-1837. If you use PHP and a vulnerable version, find the patch at http://svn.php.net/viewvc?view=revision&revision=300843. Please remember: if a new version for a software goes out and it does not affect your operation, please use it. It will help you to prevent future headaches.